The Bulgarian National Bank will release a new Bulgarian commemorative coin on February 22, 2010 to mark the 140 years of the Bulgarian Exarchate. The coins will be struck in 92.5% silver and partially plated in gold. The obverse of the coin features the logo of the Bulgarian National Bank with the year “1879” on the strip. Below the logo, a floral motif and the nominal value of “10” appear. Around the outer ring of the coin, inscriptions read БЪЛГАРСКА НАРОДНА БАНКА (“Bulgarian National Bank”), ЛЕВА (“levs”) and the year of issue “2010”. 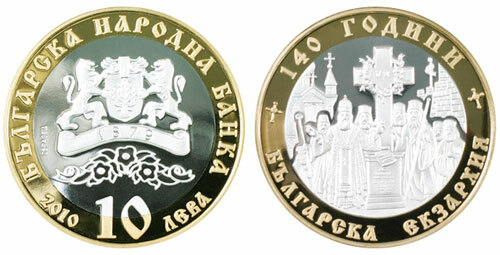 The reverse of the coin features a replica of the lithograph Monument of Liberation of the Bulgarian Church by Nikolai Pavlovich. Around the outer ring, inscriptions read 140 ГОДИНИ (“140 years”) and БЪЛГАРСКА ЕКЗАРХИЯ (“Bulgarian Exarchate”). The commemorative coins were designed by Vanya Dimitrova. Each coin is struck in proof quality with a weight of 20 grams and diameter of 40 mm. The mintage has been set at 6,000. The coins will be available at Bulgarian National Bank teller desks for BGN 60 including VAT.